Beginning with pregnancy and continuing until the child is ready to enter the third grade, health, education and community support organizations are collaborating to give moms and their new babies a greater bond while boosting the child’s development. It’s Raising St. Louis, a program launched in January 2014 only in a few zip codes – 63112, 63113, 63115 and 63120. “Our primary long-term goal is meaningful improvement in health and school outcome by third grade,” said Thomas Santel, lead developer of Raising St. Louis. It works systematically with effective programs already in existence, and connects expectant mothers and new moms with babies to those services. Raising St. Louis chose the four zip codes because data indicated those locations may have the most need. “The demographics in those four zip codes indicated significant challenges and appeared to us to be a little bit less served by various organizations, so we just thought we’d start there,” Santel added. Services for mothers and babies signing up for Raising St. Louis are free of charge throughout pregnancy and early childhood. The visit at-home (or another convenient place) program includes services from Nurses for Newborns and Parents as Teachers; information about health, safety and child development; parenting tips, rewards and referrals for other resources, such as food pantries and shelters. “All of my kids were spaced out, so I was pretty much clueless and was trying to remember what it was like when I had a baby,” said mother of three, De’Borah Gibson-Harris of St. Louis. She has a 14-year old son, a 9-year-old daughter and a 15-month-old daughter Za’niyah, who she describes as her high-energy baby. Gibson-Harris said the program was a welcome refresher course during her pregnancy. The visits after Za’niyah was born have been impactful as well. In fact, her baby’s curiosity during one visit turned into a development milestone. Mothers we talked to particularly enjoy the monthly group sessions with other parents. “It helps you interact with other parents and see their perspective on things too. I really enjoy the program,” said Keisha Ross of St. Louis. Ross is mother to an 8-month-old daughter Jon’nae, after having three sons, ages 15, 8 and 7. She said the program has helped her interact and better understand her baby. 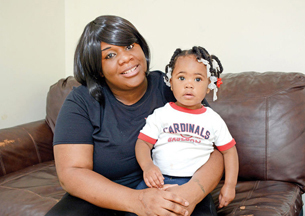 Raising St. Louis’ kid’s cash program is an incentive for the mothers. Raising St. Louis partners include BJC Healthcare, Father’s Support Center, St. Louis, Barnes Jewish College Goldfarb School of Nursing; Maternal, Child and Family Health Coalition; Nurses for Newborns; Parents As Teachers; St. Louis College of Pharmacy; St. Louis Public Schools; and Washington University in St. Louis’ School of Medicine and Brown School of Social Work. “A lot of programs are made for teens and stuff and it’s really for all ages, and I like it,” Ross added. Currently, Raising St. Louis is working with more than 80 families that live in those four zip codes. If families are already registered and moved in other locations, the services do follow them to other areas in Missouri. And they are expanding their recruiting area by two zip codes on June 1. “We’re going to add 63106 and 63107,” Santel said. To register for Raising St. Louis, call 314-747-7785 or for more information, visit www.raisingstl.org.